The plywood I chose is birch finish, which is super smooth and actually looks pretty dang good. I am hoping to give the whole thing a few finishing coats to make it all shiny when all’s said and done. The wheel wells with bed liner are 8.5″ tall, so we cut the 4×4 pieces to the same height so that I would have as much head space above the storage area as possible. We still have to finish the side insert pieces which will be able to be pulled out for side storage space access, but at the moment it’s still functional and almost finished. 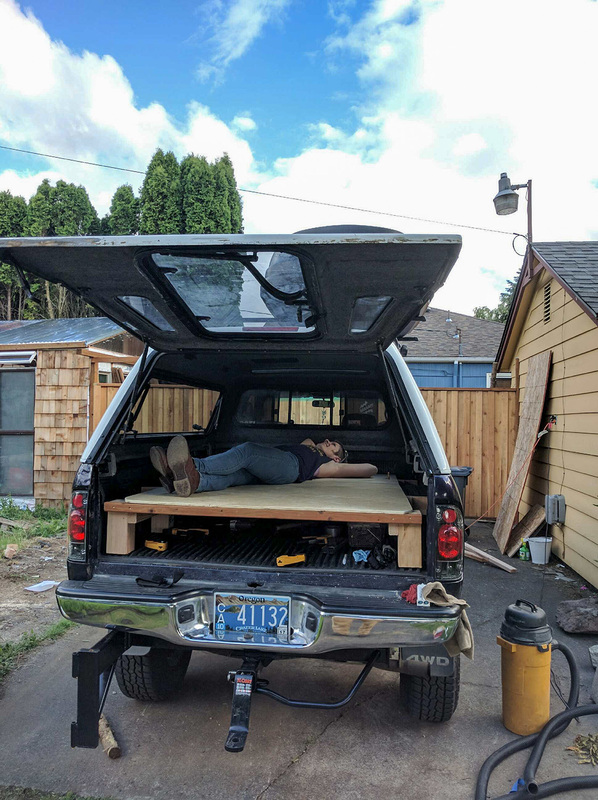 The plywood middle topper panel is split in two, the smaller area toward the cab has two rope handles so it can be pulled out for access without opening the canopy hatch door (or removing the other stuff near the back of the truck bed) and the larger panel is on hinges so when you’re standing at the back of the truck you can lift it for easy access.